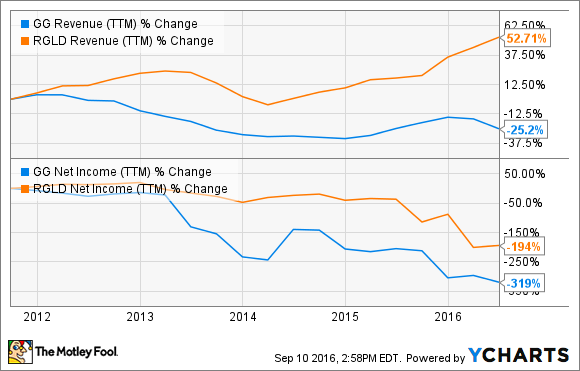 Royal Gold is more profitable, but Goldcorp is trading for a much lower valuation -- here's the one you should buy. The recent eye-popping rally in gold stocks could make any investor greedy, but every gold stock isn't the same when it comes to investing. Take Royal Gold (NASDAQ:RGLD), for instance, which isn't really a gold miner but gives you exposure to precious metals just like miners. Royal Gold could make a great bet today, but should you still choose it over a stock like Goldcorp (NYSE:GG), which is trading way cheaper than most gold stocks today as it's up only about 36% year to date when peers, including Royal Gold, have rallied triple digits? Let's find out which stock wins in this interesting face-off. The key to choosing between Royal Gold and Goldcorp lies in understanding their hugely different business models. Goldcorp is a traditional gold miner -- it extracts gold along with metals like silver from mines to sell in the market. Royal Gold, on the other hand, doesn't produce precious metals. Instead, it finances miners up front and buys precious metals produced by the miners at reduced costs. So Royal Gold secures bullion streams from miners without having to explore mines. For example, Royal Gold paid $610 million cash to Barrick Gold (NYSE:GOLD) last year. In return, it can buy a percentage of the gold and silver that Barrick produces from its Pueblo Viejo mine at 30% of the spot price. The price goes up to 60% beyond a certain threshold. The above example highlights another unique aspect of Royal Gold's business: Its competitors, like Barrick here, also happen to be its "suppliers." That might sound like a competitive disadvantage, but it's just the opposite as Royal Gold can exploit the dire financing needs of miners and get precious metals at low costs. That's a win-win, and explains why Royal Gold has handily outperformed Goldcorp in terms of growth in top and bottom lines despite being a much smaller player. GG Revenue (TTM) data by YCharts. In fact, even Barrick lost more money than Royal Gold over the years despite being the "lowest-cost" gold producer. That's because Royal Gold doesn't have to bear any of the humongous costs associated with exploration, operation, and maintenance of mines unlike pure-play miners like Barrick and Goldcorp. Royal Gold's cost of sales is essentially the price it pays to buy metals from miners, which is far below the market price. So you wouldn't hear the concept of all-in sustaining costs in case of Royal Gold, which otherwise is a key measure of costs for miners like Goldcorp. Goldcorp also faces executions risks as it ramps up its mines as any delay or setback can cause sufficient capital loss to the company. In other words, Royal Gold's unique business model leverages it to prices of precious metals like Goldcorp but at significantly lower costs. No wonder then, that streaming has proven to be a more profitable business than mining. 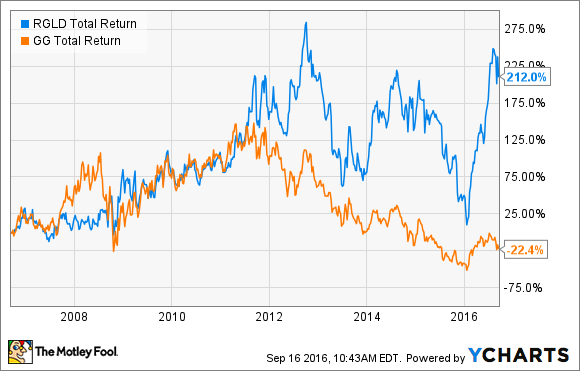 Royal Gold has even crushed Goldcorp in terms of shareholder returns (stock price appreciation plus dividends) in the past decade. If that performance gap blew your mind away, you'd be surprised to know that Royal Gold has increased its dividend every year for 14 straight years, without flinching even during the commodities bubble. Royal Gold has grown its dividend at a compounded rate of 21% since 2001. Royal Gold's dividend history. Data source: Royal Gold. In sharp contrast, Goldcorp started paying out a dividend only early last year. But it has had a hard time maintaining it since -- Goldcorp has already cut its dividend twice. It first slashed its dividend by 60% in Aug. 2015, and then moved from a monthly payout to quarterly payout in February this year, effectively lowering its annual dividend by almost two-thirds. Currently, Royal Gold offers a dividend yield of 1.2% compared to Goldcorp's 0.5%. So, no matter which way you see it, Royal Gold appears to be a far better stock than Goldcorp. While past performance doesn't guarantee future returns, there's no denying that Royal Gold's business carries lesser risk than Goldcorp. Goldcorp stock may entice you today as it has has hugely lagged peers so far this year and even looks pretty cheap at a price-to-book ratio of 1 and price-to-sales ratio of 3. But as investing in commodity stocks and volatility go hand in hand, Royal Gold makes for a much safer bet for the long haul.